In a hard hat, reflective vest and protective boots, Laura Mason's job is to make sure Metro's track work stays on schedule, and that the right equipment is in the right spot. 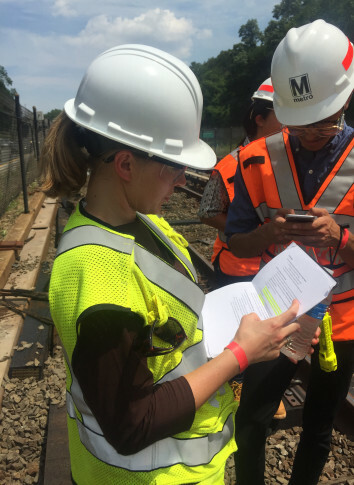 WASHINGTON — In a hard hat, reflective vest and protective boots, Laura Mason surveys progress on continuous Metrorail track work between Ballston and East Falls Church in Virginia. It is her job to make sure everything stays on schedule, and that the right equipment is in the right spot. WTOP’s Max Smith gets a behind-the-scenes look at Metro’s track work. See photos. “It’s a challenge, it’s a challenge I enjoy,” Mason said as she stood along the tracks in the middle of Interstate 66 last week. “It’s an incredible amount of work going on out here…We’re doing about 1,300 crossties planned for surge five, so we’ll get that done in 12 days in total…it would take us eight months to do that if we were doing it just at nights without limiting service. That’s the value of these surges, is being able to get so much more work done,” she said. Mason came to Metro from Bechtel in June, where she had worked on the first phase of the subway’s Silver Line. Now, the electrical engineer with a focus on project management is responsible for sorting out priorities and planning for each of the already announced work zones that run through March 2017. “I’ve really focused my energy on improving our planning and our coordination, looking farther ahead in the planning process and making sure we can maximize every hour of track time,” she said. That includes visiting the current or upcoming track work zone at least twice a week. “I like it because I know enough engineering to be dangerous,” she said, smiling. “I like being out here, it’s fun to see it, makes it real,” she said. In the case of this work zone that runs through Sunday, she joined track crews that are taking about 25,000 steps each day walking in, out and through the two-mile work zone. “It’s definitely hot and sweaty,” she said. The heat not only means extra efforts to make sure there is enough water available and that crews are taking adequate breaks for safety, but it also changes the work that can actually get done. 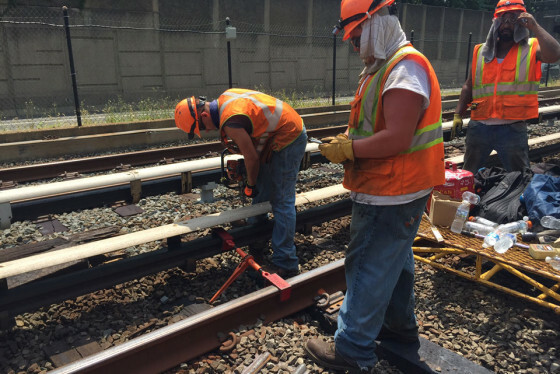 Since heat can cause rails to bend or buckle, crews have to make extra passes through an area to replace all of the rotted rail ties Metro wants to remove. “Part of the reason why crossties are so valuable during the surges…is that to get those 10 pieces of equipment out during normal nights takes a long time to move that equipment, and so we in effect average five crossties a night, as opposed to out here once it’s out here and working we can do many many more,” Mason said. Once crews check their own work, Metro’s new internal quality assurance group reviews it. The Federal Transit Administration also conducts spot inspections. One of the biggest changes for Mason from the Silver Line construction is that she now must consider active passenger trains just a few feet away. “When you’re building it new, there’s no trains running on it, and that definitely does change how you approach the work and the rate at which you can move because you have to always be careful and cognizant of that traffic,” she said. There are regular calls with departments across Metro to put all of the pieces together for each work zone. “Everything it takes to get all of the pieces in place: the bus shuttles, the customer service reps, the police, the communication with the cities, accessing the track,” she said. After a series of work zones so far that have been one to two weeks long, the “surges” get longer during the fall. After a major disruption from a seven-day work zone on the Red Line Aug. 1 to Aug. 7, and a work zone on the other side of the Red Line that lasts 10 days from Aug. 9 to Aug. 18, a series of work zones in late August, September and October last up to 42 days. Riders will face 17 days of single-tracking on the Blue and Yellow Lines at the end of August and early September, followed by six weeks of single tracking on the Orange Line between Vienna and West Falls Church, then three weeks of a complete shutdown of the Red Line between Fort Totten and NoMa-Gallaudet. “These are very big and challenging projects. It takes a lot of people working together in a very coordinated fashion. I think sometimes when you’re just riding on it it’s easy to take for granted what it took to build it in the first place and what it takes to maintain it,” she said.